Get Ready for the Sundance Hit PATTI CAKE$ hitting theaters August 18th! A huge hit at both Sundance and Cannes Film Festivals, the breathtaking, inspiring, full of fire and beats independant New Jersey hip hop drama PATTI CAKE$ is now set to release in U.S. theaters on August 18th and then will open in additional cities the following week and on Labor Day weekend. 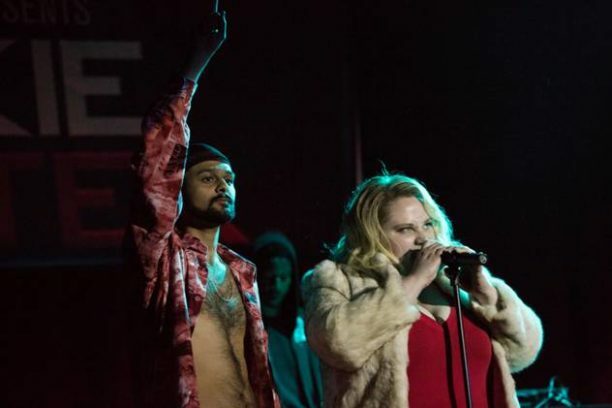 Led by cast members Danielle Macdonald and Siddharth Dhananjay, the acclaimed film directed by Geremy Jasper, also stars Bridget Everett and Cathy Moriarty. Patti Cake$ is a brilliant coming-of-age story set in gritty strip-mall suburbia in Jersey. The film chronicles an unlikely rapper who finds her voice and follows her quest for fame and glory with humor, raw energy and some unforgettable beats. We will have a review coming up next week but all we can say is that ever since we saw this cool film, the tale of Patti Cake$ has stayed with us and we can’t wait to see it again. Check out the trailer, a couple dope sneak peeks and this killer cool music video! Stay tuned we have a fab interview with Siddharth Dhananjay coming up on Tuesday!